House of the renowned National Park of Tamil Nadu, Nagarhole is open for public all through the year; however the best time to be here is from October to May. November to January- Winter season is dominated by pleasant temperature. Days are comfortably warm and nights are cold. The pleasant weather conditions make it an ideal time for tourists to enjoy sightseeing and planning fun filled outings. March to April – The weather is warm, and the temperature varies from 20°C to 33°C. It is the time when you can see flocks of animals moving around in the sanctuary. June to September- Nagarhole receives medium to heavy rainfall in this season. Although some of the areas of the sanctuary are closed in this season, despite of these closed areas, the sanctuary and Nagarhole have so much to offer that you will not be disappointed. Do not forget to carry your rain gear with you. Pleasant Weather in this month is pleasant with clear blue sky and rich greenery covering the area. Temperature is within comfortable range and the cool breeze offers refreshing ambiance. This month is perfect for tourists to plan an idyllic tour to Nagarhole national park, as well as enjoy outdoor activities and sightseeing. Pleasant February has very pleasing climate with beautiful days offering warmth and bright sunrays, thus making the weather suitable for outings. This period witnesses cool breeze which can make the evenings and nights quite cold, thus carrying warm clothes is suggested. Especially for families on a tour to Nagarhole, this place is a delight to enjoy with children. Moderately hot With the beginning of this month summers start to hit the region but the temperature stays within comfortable range. The bright sunlit days warming up the town and the tranquil evenings make this month a complete package for holidays. Outdoor activities like visiting the wildlife reserve, jungle safari etc can be carried out in this season. Very Hot This month has hot sunny days but within bearable zone. Temperature is expected to increase thus wearing light cotton clothing is recommended. For tourists who love animals, birds and the serene view of the flora fauna, this month has it all. As animals move towards the lakes in search of water and food, this time is ideal to discover the wonderful facets of Nagarhole National Park. Very Hot The month of May witnesses extreme summers. With rising mercury level, the temperature is expected to reach about 35 degree Celsius in this month. You can enjoy the clear blue skies, but weather is mostly hot and humid so make sure you carry sun protection gears during your trip. Tourists can enjoy the grassy swamps, distinct animals walking freely and the diverse assortment of Eucalyptus and Teak trees. Rainy June brings in the monsoon rains. The weather is cool with intermittent downpours that completely drench the region. Though jungle safari cannot be enjoyed at this point, Nagarhole has some beautiful scenic sights, while the enthralling waterfalls are a delight for nature enthusiasts. For those who are planning a tour to Nagarhole in this month, make sure you carry your rain gears. Rainy July witnesses heavy to moderate rainfall on most of the days, thus offering a relief from the tiring summers. Temperature is expected to lower down, as the cool breeze makes the weather quite cool but enjoyable. This month is a delight for rain lovers as they can enjoy waterfalls and springs in their full flow and enthralling beauty of deciduous forest at its prime. Though outdoor activities are difficult to carry out, during this season tourists can relax in the serene vicinity of this region. Rainy Across this month rainfall tends to wet the area and might cause interruption in outdoor activities, so make sure you have your raincoats and umbrellas with you. Days are mostly cloudy and the natural vista drenched in rains imparts the look of a paradise. For nature enthusiasts this month is an ideal location to plan a holiday with friends. Rainy With this month monsoon showers begin to fade away, but you can still witness frequent showers at any time of the day. Also the temperature starts to become comfortable, thus making the climatic conditions favorable for tourism. With the end of this month spring season marks its presence, thus the tranquil view of the park is worth watching. Pleasant October is the month when rains settle down completely. Weather becomes extremely pleasing and the park looks refreshing after being washed by occasional showers. This month invites maximum tourists to enjoy the serene beauty of this region and indulge in various outdoor activities, such as safaris. Pleasant November has the best climatic conditions and this month sees maximum influx of travelers from all across the world. Temperature lowers down to a comfortable range and becomes perfect for catching sights of diverse species of animals, including Sloth Bear, Loris, Pangolin, Languor, Wild Bear and herds of elephants near the lakes. 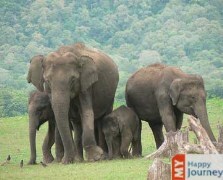 For tourists tour packages at lowered rates are made available that help you spend an affordable holiday at Nagarhole. Pleasant Weather during December in Nagarhole is calm and quite cold. You can enjoy clear sky and bright sunlit days warming up the surroundings, whereas the nights are expected to get cold. This month offers you various outdoor activities. For tourists a visit to the wildlife and safari rides can be best enjoyed during this season.